Geocube is an attractive online resource about Geography. 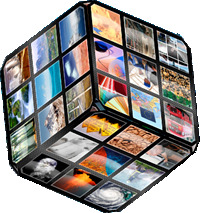 Geocube is based on the principle of the Rubik Cube with six faces and 54 topics. It is a virtual and easily accessible website which is available online for free. Move the Geocube around with your mouse and explore the faces and topics.Geocube provides an accessible way to read, see and watch what Geography is and geographers do. All of these sites have been assessed by human beings with brains and are deemed to be authoratitive and useful to students; of course, the final decision of whether or not a source meets the C.R.A.P. test is always up to YOU! GeoGuessr -- Where in the World? Overlap Maps -- instantly compare any 2 places on Earth! If it Were My Home -- IfItWereMyHome.com is your gateway to understanding life outside your home. Use our country comparison tool to compare living conditions in your own country to those of another.